It is an anniversary the Tories may prefer to forget. Twenty-five years ago, September 16 1992, better known as ‘Black Wednesday’, the day the Pound was forced out of the European Exchange Rate Mechanism (ERM). This humiliation of John Major’s government delivered fatal damage to the Tory Party’s reputation for economic competence and ignited a furious internal struggle over the Maastricht Treaty which ravaged their ability to govern at all. The Labour Party, then led by John Smith, brilliantly exploited these twin economic and political crises, paving the way for Labour’s 1997 General Election victory and over a decade in the political wilderness for the Tory party. A quarter of a century on Labour has a similar opportunity to wreak havoc on the faltering administration of Theresa May. But it requires Jeremy Corbyn to be as astute over Brexit and the Single Market as Smith was over the ERM crisis and the votes on Maastricht. The origins of the Tory’s ERM fiasco go back to the failure of their economic policy in the mid-1980s. The then Chancellor of the Exchequer Nigel Lawson cut taxes for the rich, kept interest rates low, and promoted privatisation. Wishfully thinking he had created an ‘economic miracle’, instead he unleashed an unsustainable boom in house prices and soaring inflation, followed by recession and rising unemployment. Struggling to find a credible counter inflation policy, Lawson opted to shadow the Deutsche Mark (DM) and tried to persuade a sceptical Margaret Thatcher to join the ERM against the advice of her economic adviser Sir Alan Walters. With open warfare declared between Number 10 and 11, Lawson’s resignation was inevitable and happened on October 27th 1989 just days after John Smith, then Labour’s Shadow Chancellor, had taunted him in the House of Commons to “jump before he is pushed”. 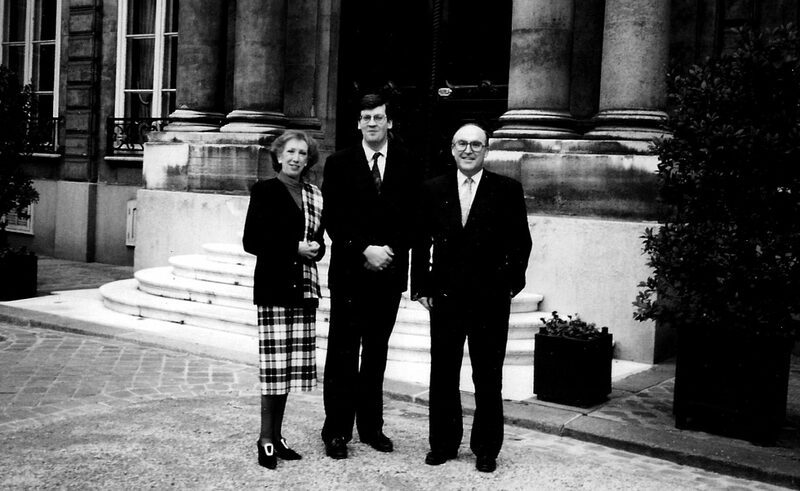 John Major took over as Chancellor and in October 1990 Thatcher finally accepted ERM membership proving that the ‘Iron Lady’ was for turning after all. But in the act of joining the ERM, the Conservatives sowed the seeds of their own destruction – a familiar story of the Tory’s playing critical European policy issues for domestic political advantage which then blows up in their face. Thatcher’s acceptance of the ERM came with a condition; an immediate interest rate cut from 15 to 14 per cent. But in her haste to gain favourable news coverage, the procedure by which ERM members were consulted in advance about the entry level didn’t occur. Members were curtly informed that the UK had decided unilaterally to join at a central rate of DM 2.95. These antics sent a signal both to the markets and to the UK’s European partners that joining the ERM was driven, not by a considered commitment to multilateral currency coordination, but by opportunistic internal Tory politics. Particularly unhappy with entry at DM 2.95 was the then President of the Bundesbank, Karl Otto Pohl, who believed the rate was far too high. Smith knew of his concern because at a meeting in Bank’s Frankfurt headquarters in 1989 Pohl had told him off the record that the UK should enter no higher than DM 2.60. Ignoring the Bundesbank’s reservations, the UK decision to join the ERM was announced on the late afternoon of October 5th. This was deliberately timed to take the headlines away from the last day of a successful Labour Party Conference then riding high in the opinion polls, and just before what turned out to be Mrs Thatcher’s final Tory Conference as leader. Weakened by the disastrous impact of the poll tax and the resignation of her Deputy Geoffrey Howe, Thatcher was ousted by her own party just over a month later in November 1990. Her successor, John Major, set about restoring Tory credibility. In 1991 he ended the hated poll tax, looked statesman-like during the first Gulf war, and was seen to have skilfully negotiated the Maastricht Treaty establishing the European Union (EU) by securing opt outs from the single currency and the Social Chapter. The new Chancellor Norman Lamont also reduced interest rates in stages by 4.5% to try to pull the economy out of recession and stem further job losses. In the Autumn Labour’s previous strong lead in the opinion polls narrowed and, with the huge advantage of not being Mrs Thatcher, Major unexpectedly won the General Election on April 2nd 1992. However, in a few months Major’s administration was floundering in a crisis from which the Tories could not recover. To ease inflationary pressures from German unification the Bundesbank had raised its domestic interest rates. With the Pound now obliged to remain within the ERM’s currency bands pressure mounted to increase the UK’s borrowing rate. This was the exact opposite of what was needed in the middle of a recession. The Bundesbank wanted a general realignment with an upward revaluation of the Deutsche Mark to ease reliance on higher interest rates. But Major and Lamont dismissed all talk of a realignment. Major even boasted that he wanted the Pound to replace the DM as the strongest currency in Europe. Such hubris would not last long. The Pound was vulnerable to a growing view in financial markets that it could not hold its place in the ERM. Difficulties with the ratification process of the Maastricht Treaty also spooked the markets when a referendum in Denmark unexpectedly resulted in a ‘no’ vote. President Mitterrand then promised a referendum in France as opinion polls also pointed towards another possible ‘no’ vote. By early September markets sensed blood and currency speculation mounted, first against the Italian Lira. The Bundesbank again tried to promote an ERM realignment at a meeting of European Finance Ministers held in Bath on September 5th. However Norman Lamont ruled out any official discussion of the option and instead tried to bully a furious Helmut Shlesinger, the newly appointed Bundesbank President, to cut German interest rates. By September 13th the pressure on the Lira grew too strong and it was unilaterally devalued as the Bundesbank agreed to make a very modest reduction in its borrowing rates. The next day, prompted by a media interview in which Shlesinger again spoke in favour of a realignment, the currency traders turned on the Pound which fell to its permitted floor of DM 2.78. The markets opened Black Wednesday with the Pound facing a torrent of speculative pressure. By mid-morning the Bank of England raised interest rates by 2% and then again in the afternoon by a further 3%. But all to no avail. Despite spending billions in reserves, the Pound continued to haemorrhage support. Early that evening the UK withdrew from the ERM. Views on the economic consequences of the ERM debacle remain sharply divided. But whether September 16th 1992 is described as ‘black’ or ‘white’ Wednesday one thing is clear: the political impact on the Conservatives was instant, devastating, and enduring. In July 1992, just before John Smith’s election as Labour leader, Gallup’s opinion poll gave the Tories a small four-point lead. By October Labour enjoyed a huge 22 point poll advantage over the Conservatives and remained well ahead of them all the way to the 1997 election. Only after David Cameron became Tory leader in 2006 did the Tories regain consistent opinion poll leads over Labour. With hindsight, it is clear now that Black Wednesday was an unmitigated disaster for the Tories. Whether under the leadership of John Smith or subsequently Tony Blair, the question was not if Labour would win in 1997, but rather by how much. In the aftermath of Black Wednesday Smith launched a devastating onslaught on John Major’s Government. In a recall debate on September 24th Smith mocked Major’s ambition to have the Pound replace the DM “as having a certain detachment from reality of which Walter Mitty himself would have been proud” and labelled him the “devalued Prime Minister of a devalued Government.” Smith’s performance was widely acclaimed and even John Major conceded that Smith gave a “brilliant debating performance” admiring his “brass neck” given Labour’s pro ERM policy. What Major overlooked, however, is that soon after the 1992 General Election Smith made a significant change to Labour Policy favouring the possibility of an ERM realignment. In June at a meeting of Labour Members of the European Parliament Smith suggested that an ERM realignment “was likely” and “could permit a reduction in German interest rates leading to similar reductions throughout the Community”. In July, in one of his last acts as Labour Leader, Neil Kinnock also argued for a realignment in a letter to the Financial Times. And, just days before Black Wednesday, on 9th September Smith repeated his call for a realignment in a BBC interview during the TUC Congress. Smith’s support for realignment caused some tension with Gordon Brown, who had just taken over as Shadow Chancellor. Brown was sensitive to the legacy of devaluation that had badly undermined Harold Wilson’s government in the 1960s. He also wanted to head off calls for unilateral devaluation led by Bryan Gould who had just challenged Smith for the Labour leadership. In 1989, Gould had reluctantly supported ERM membership on condition that entry would be at a competitive rate which was accepted as Labour policy. Unsurprisingly Gould was critical of the rate chosen by the Tories to enter the ERM, a view privately shared by Smith and informed by his earlier discussion of the issue with Karl Otto Pohl. Arguably Brown was too cautious about the stigma of Labour’s 1967 devaluation given that an ERM realignment was an entirely different policy context, and Gould’s career in UK politics was coming to an end as he soon took up an academic role in his native New Zealand. Smith, a pragmatist about exchange rate policy, had no problem supporting the need for a competitive rate in 1989 or arguing in favour of an ERM realignment after the general election in 1992. He knew perfectly well that the Tories had bungled the Pound’s entry into the ERM. The problem was that saying this before the 1992 election would have been economically irresponsible and politically suicidal for Labour. To do so would have encouraged speculation against the Pound and have allowed the Tories to label Labour as the ‘party of devaluation’. As much as Smith was strongly in favour of transparency and open government, such candour on the value of the Pound ahead of the 1992 election was out of the question. But afterwards, and crucially before the ERM debacle, he moved decisively to change the policy. If Black Wednesday wrecked the Tory’s reputation for economic competence it was the Maastricht Treaty ratification crisis that destroyed their ability to govern. The struggles over the European Communities Amendment Bill intensified in November 1992 as Major’s government attempted to regain its composure after the collapse of the ERM policy. Labour’s strategy, crafted by Smith together with George Robertson, then Labour’s European spokesperson, was not to block ratification but rather to drag out the legislative process as far as possible, tabling amendment after amendment, with the main aim being to remove the opt-out on the Social Chapter. By creating opportunities for repeated rebellion by Tory Eurosceptics, Labour’s front bench also aimed to sap the strength of the Government and put the spotlight on its growing internal anarchy. In February, these tactics led to Major’s first Commons defeat on an amendment relating to the UK’s membership of the EU’s Committee of the Regions. Although not decisive, the vote was a humiliation for Major. Meanwhile Robertson had set a ‘ticking time bomb’ amendment on the Social Chapter which was finally put to the vote on July 22nd. With Tory whips (including one David Davis) desperately trying to keep their rebels on side, the vote initially resulted in a draw1. Then, in a second division on the Government’s motion to reject the Social Chapter, Major was defeated by 324 votes to 316. The embattled Tory leader, describing some of his parliamentary colleagues as the ‘bastards’, had no alternative but to use ‘the nuclear option’ of a confidence vote on the government’s Social Chapter opt-out. Threatened with annihilation in a general election, the Tory rebels fell into line. But John Smith’s command of the House of Commons was clear for all to see. At the end of the Maastricht negotiations the Tories had declared ‘game set and match’ for Major. But Smith, switching to Major’s preferred sport of cricket, declared that “he was clean bowled yesterday and he has been forced to follow on today”. A month earlier a sacked Norman Lamont told the Tories that they “give the impression of being in office, but not in power”. Labour’s parliamentary tactics over Maastricht fully demonstrated the validity of Lamont’s scathing remarks. In marked contrast to the Conservatives, Labour had also kept its own divisions under control despite having as many potential anti-EU rebels. Smith, for example, was very cautious about the prospect of a single currency and reassured Labour MPs that the party wouldn’t endorse it unconditionally. He sought the widest possible support for Labour’s approach, taking the highly unusual step of allowing a series of debates in the Parliamentary Labour Party before the Shadow Cabinet agreed the whip. All the votes went Smith’s way but his inclusive style earned respect from among even the most persistent Maastricht rebels such as a certain Jeremy Corbyn. So, what are the lessons for Labour today? First, don’t hesitate to change policy if growth, jobs, and investment in the British economy depend on it, exactly as Smith did by pushing for ERM realignment. Second, relentlessly exploit Tory ideological divisions over Europe as they care more about these than the best interests of the UK. And third, build the widest possible unity of purpose among Labour MPs and members. The softening of Labour’s Brexit policy announced by Keir Starmer is a good start and the EU Withdrawal Bill is the perfect opportunity for another ‘ticking time bomb’ amendment to destroy what little remains of Theresa May’s credibility. John Smith would have been horrified by Brexit and would have campaigned passionately against it. Today, Smith the politician would acknowledge the result of the referendum, but Smith the lawyer would forensically expose Brexit’s ambiguities and delusions, and Smith the patriot would always fight for what he believed was right for Britain. I also believe that he would argue that there is far more flexibility in freedom of movement rules than is commonly understood, and that a strong framework of employment law, exemplified by the minimum wage that he so strongly campaigned for, is the best way to defend working people in the UK wherever they are from. In 1971 Smith was one of 69 Labour MPs that rebelled against the Whip to vote in favour of joining the European Community. He argued then that he was “willing to give up some national sovereignty to gain sovereignty which will be able to do something about controlling the international companies of the future…I believe that the fundamental of democratic socialism is that economic forces must be brought under popular control and be fashioned towards social and political ends which the people determine. If we do not enter Europe we shall not be in a position to control them and achieve those economic, social and political ends which we on this side hold among our main political objectives”. That is why in 1993 Smith fought so hard for the Social Chapter to be included in the Maastricht Treaty and today he would argue that the Single Market, though far from perfect, is not just our biggest trading partner but also the most comprehensively regulated economic area for social, employment, environment, and consumer rights anywhere in the world. That explains Tory support for a hard Brexit, and why Labour must mobilise to defeat it. Not to do so would be to betray the future of young people that overwhelmingly reject the Tory agenda of austerity and isolation. John Smith would be their champion and never miss any opportunity to attack the folly of Mrs May’s Brexit chaos. That is the task facing Labour now. 1 The Speaker Betty Boothroyd cast her vote for the Government as procedure required but subsequently it turned out that there had been a miscount and the Government had in fact won by a single vote.